We love showcasing our wedding work on our very own blog. From welcome cocktail parties and rehearsal dinners to ceremonies, formal receptions and dance parties, there is no shortage of material to spread the word about who we are and what we do. This past February, the very awesome Lauren + James chose to trash the dress with photographer Daniel Jireh, and the results were simply stunning. The trendy Cape Thompson resort was the location of Lauren + James’s banging Saturday night wedding bash, and when it came time to trash the dress, well why fix what isn’t broken, right? This energetic couple showed no signs of the post-party hangover the following morning as hair and makeup guru Alma Vallejo arrived to get our bride “wedding ready”. Alma styled Lauren’s platinum blonde locks into loose waves and focused on creating a flawless complexion with natural makeup to allow Lauren’s form-fitting, flamenco style gown with plunging neckline to shine. James looked dapper in black dress pants and a jacket, with his casual tan loafers and unbuttoned shirt adding a touch of the Cabo casual to a look that we like to call “beachy sophistication”. The über talented Daniel Jireh isn’t one to sit around and idly click his camera as the bride and groom do all the work. Having established a solid “click” with Lauren + James during their wedding session, all bets were off. He had them sipping liquor, shooting pool and sprawled on the lobby floor before the first half hour was up. After a quick dress change for Lauren, the fun kept on coming. The Cape Thompson’s many nooks and crannies, combined with its striking, contemporary architecture, meant that our location options were endless, and we took advantage of every last one. 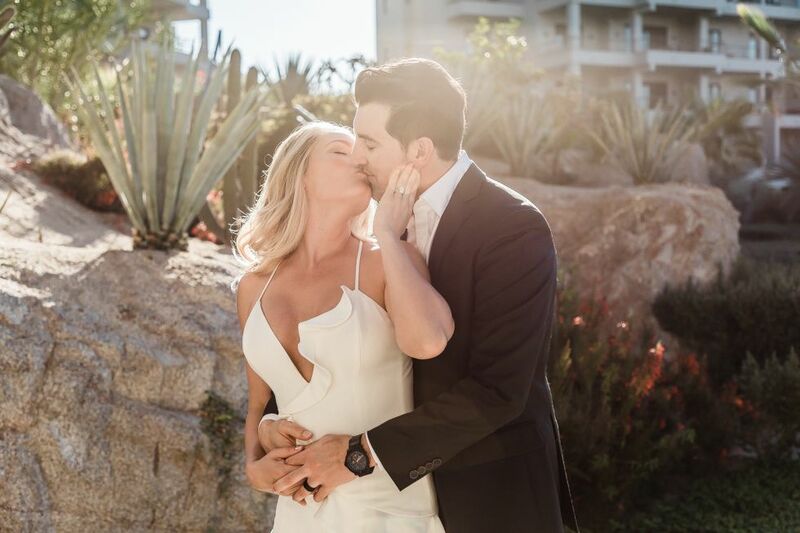 The warm February afternoon and Cabo’s famous sunshine resulted in some gorgeous, toes-in-the-sand shots and Lauren + James weren’t afraid to get wet. All in all, this trash-the-dress session reminded us why we love it when our couple’s think outside the box! Congratulations Lauren + James, this is one wedding album you’ll be proud to share. We know we are!